Last Thursday I arrived for my volunteer shift at the Museum of Flight only to discover a press conference was about to start and we were all invited. Jeff Bezos was there to officially donate one of the F1 engines he'd found and recovered. It was part of the Saturn V rocket that launched Apollo 12 to the moon for the second landing in 1969. Burien Blog's post includes a lot of photos. Geekwire's coverage includes the the short documentary about finding, salvaging and restoring the engines. One of the fragments is temporarily on display until January 4, 2016.Of course, I had to go over to sketch it! This fragment is the injector plate. 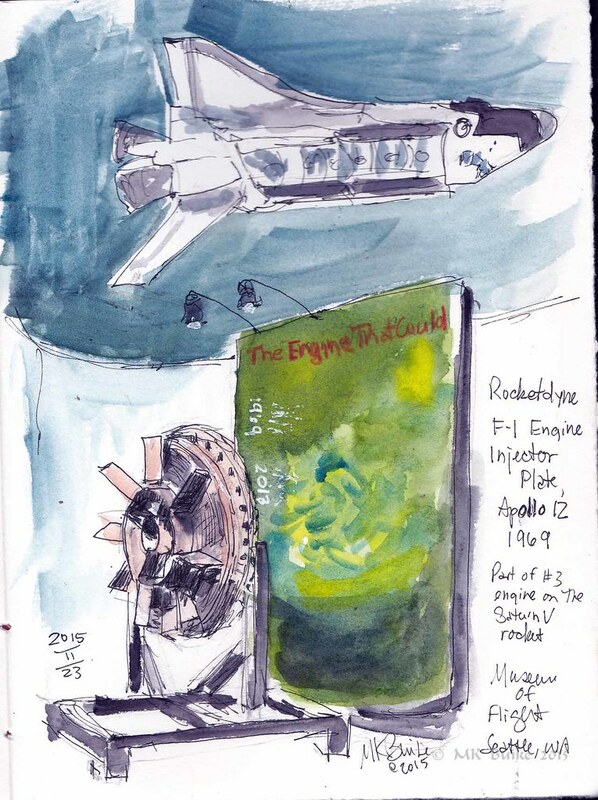 In my sketch, I also included the upside down Space Shuttle model that hangs over it in the gallery.